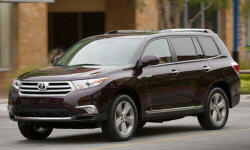 Why the 2012 Toyota Highlander? Outstanding reliabilty. No problems at all. Average 22 mpg is exceptional for an SUV of this size. Very quiet ride on any surface. Very comfortable ride. Luxury feel compared to other brands. I am 6 foot tall, and there is plenty of head and leg room in the driving position. Easy access as well. Why Not the 2012 Toyota Highlander? 3rd row seats are useless to me. Too little room for adults. Should have been an option for families with small children. With 3rd row seating, you lose storage space. Very pleased with my purchase. Met every expectation I had, and would purchase this car again. Undeniable quality, great ride, quiet, comfortable and good fuel economy.